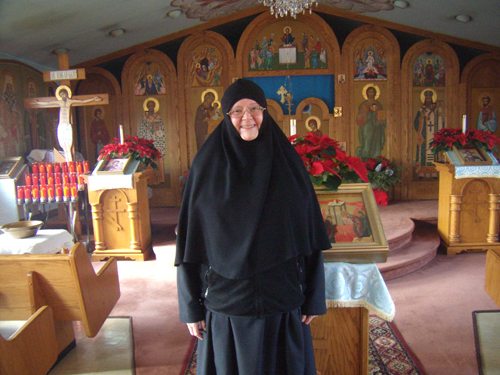 The founder and Head of the St. Innocent of Alaska Monastic Community is Sister Ioanna, who became a monastic on November 11, 2001, at the hand of Bishop (now Metropolitan) Merkurii of the Moscow Patriarchate. Having been blessed by the Lord to be close to Him since she was a child, this was the fulfillment of Sister Ioanna's teenage dream. In addition to loving the Lord, Sister Ioanna has also always loved learning and teaching, and thus has been involved in education for most of her life. Her undergraduate B.A. work at Hobart and William Smith Colleges in Geneva, NY, involved split majors in religion, philosophy and French, and included many courses in psychology and sociology. In addition, she was the first student to complete the Certificate in Religious Education program. Furthermore, she was also the first woman to receive the Canterbury Graduate Scholarship for three years of seminary study, which helped enable her to complete the Masters of Theology (M.Th.) seminary degree with a major in Systematic Theology and Philosophy of Religion at the Perkins School of Theology in Dallas, TX. Her work for the M.Th. seminary degree also included three summers at Union Theological Seminary in NYC, plus considerable study with the late Mitered Archpriest Photius Donahue (Dr. Francis Donahue, Ph.D.), a full professor in the Religion Department at Michigan State University in East Lansing and founder of St. Andrew Orthodox Church, near the campus in East Lansing. Fr. Photius served as a mentor for her, both as her Pastor and Spiritual Father at St. Andrew's Church, and academically as a professor at MSU. Furthermore, as a lover of the arts since she was a young child, many doors opened up for her as she pursued the study of Art History at Michigan State University and received an M.A. (Master of Arts) degree. She then completed an Interdisciplinary Ph.D. (Doctor of Philosophy) in Art History, Religion and Philosophy, also at Michigan State University, in which Fr. Photius Donahue played a pivotal role, including serving on her doctoral committee. Sister Ioanna taught a wide variety of interdisciplinary Humanities courses (especially History of Western Civilization and Introduction to Philosophy) at Michigan State University, Wayne State University, Lawrence Institute of Technology (now a university), Marygrove College, and briefly at St. Mary's College (Orchard Lake) and Sienna College. Dedicated to religious education since high school, while in college and after, Sister Ioanna envisioned writing and creating adult religious educational materials in which she could communicate complex theological and philosophical concepts in a manner that people without advanced theological and philosophical training could understand. Her many years of college teaching gave her much experience in communicating complex ideas in understandable ways. In addition to her academic endeavors, since childhood, Sister Ioanna has always loved the arts, and has been involved in doing many different art forms, especially singing. For the past 30 years she sang all the Divine Services at St. Innocent Church, is an experienced choir director and chanter, and is knowledgeable about the complexities of Orthodox liturgical practice and liturgical theology.